Among other things, writing a biography of Marie von Clausewitz has been a great exercise in networking and friendship-building. I have met some incredible personalities along the way and enjoyed endless discussions in person and via email. Some have shared their knowledge and tested my ideas. Others like Bernd Domsgen and Olaf Thiel from the Clausewitz Society (Freundeskreis Clausewitz) in Carl’s hometown Burg have made invaluable contributions to my project. About a month ago Bernd and Olaf called me with exciting news. 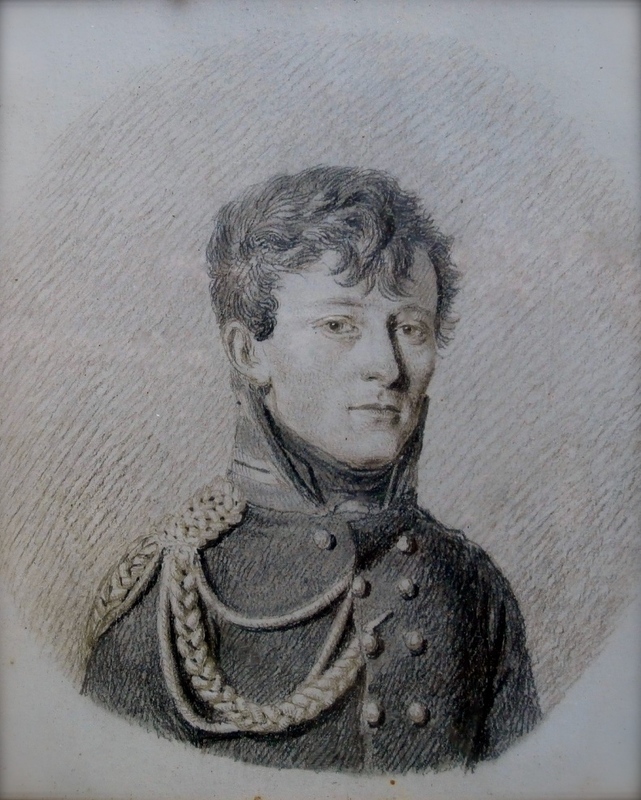 They have received a package from Clausewitz’s descendants, and in it there was a small portrait 8×10 cm (3×4 inches) of him. None of us has seen this image before. Bernd and Olaf have been researching Carl von Clausewitz’s life for a long time. 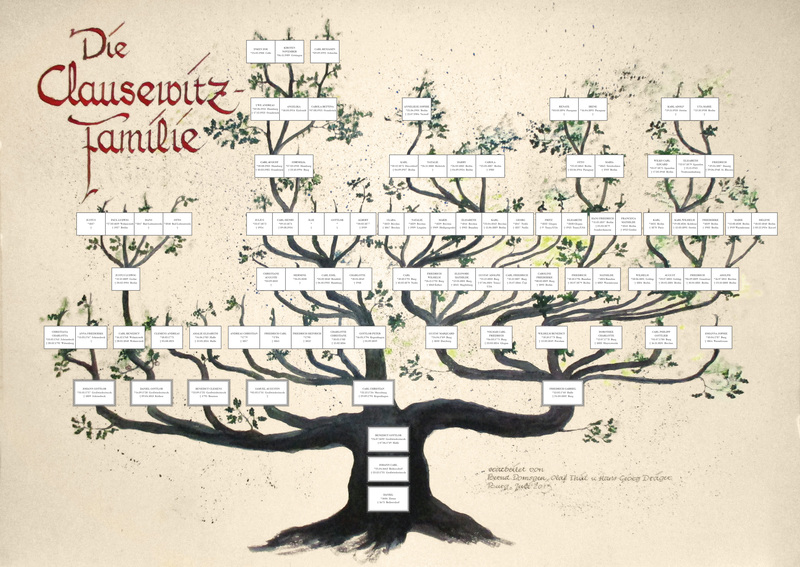 Last year they finally recreated his family tree (you can see it here). Consequently, descendants of Carl’s siblings (Marie and Carl were childless) readily searched their attics, opening up dusty boxes and discovering long forgotten documents, including this sketch from one of the descendants’ commode. There is reason to believe that Marie von Clausewitz might be the artist. The image is not signed, but her only known work of art—the portrait of Field Marshall August Neidhardt von Gneisenau—displayed at the German Historical Museum in Berlin, is not signed either. Before you ask – the curators at Germany’s foremost museum have researched the painting and the supplementary documents to irrefutably prove Marie’s authorship. 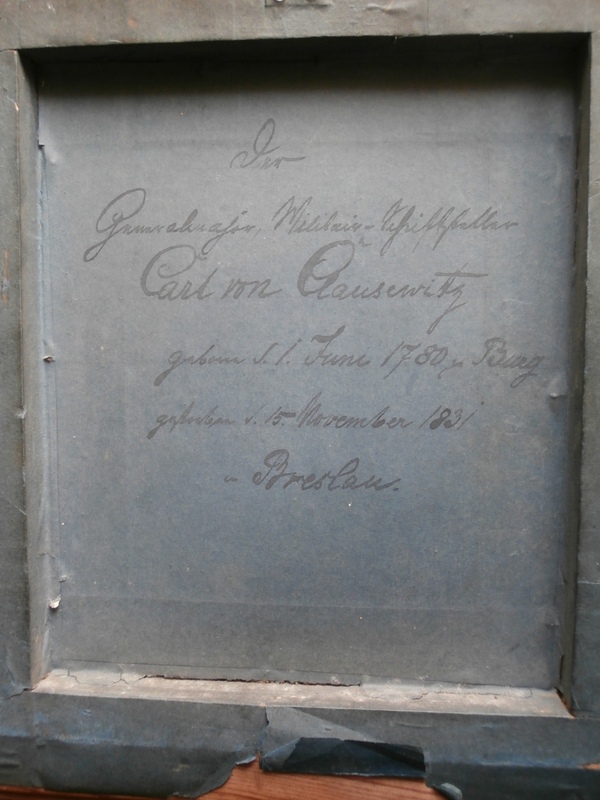 For the record, the small drawing in Burg has a note on the back: “Major General, Military Writer Carl von Clausewitz, Born on 1.June 1780 in Burg, Died on 15.November 1831 in Breslau.” The note on the back also appears from a different material added later. Besides, the mistaken date of Carl’s death—it was actually 16.November 1831—eliminates Marie as the one who wrote the inscription and suggests that it was added later by a less informed family member. Although the drawing is pleasant, its technique is far from academic; rather the work of a talented enthusiast than a professional artist. Marie previously studied art and befriended many of the famous artists of her time but she lacked extensive academic training. Her portrait of Gneisenau does not adhere to the art canons of the day. The great general’s gaze reveals his weariness and sadness after three years of war (the portrait is from early 1816), his eyes are puffy and the upper lip appears trembling. Generally, the composition is far from skillful, and Marie obviously struggled in capturing his features. Yet inherent truth remains in this unprofessional approach. Other well-known artists painted Gneisenau as a glorious war hero while in Marie’s portrait, he is a gloomy old warrior eager to hang up his uniform as quickly as possible and go back to his family and peaceful life. Just as Gneisenau felt in 1816 (unfortunately the strict copyright rules of the German Historical Museum prevent me from posting the painting but you can see it in its online catalog here). The Burg drawing is marked by the same unprofessional but truthful approach. Yet just as many other things in Carl and Marie von Clausewitz’s life story, the numerous open gaps in knowledge prohibit firm conclusions. The Burg drawing might have been the one Carl ordered for Marie in 1807 while remaining a prisoner of war in France (but then why the professional artist did not signed it?). The most significant clue connecting Marie to the painting is contained in its style. The intimacy of Burg drawing reveals a rather close relation and trust between subject and artist. Something that only Marie could achieve with Carl von Clausewitz. Similar to the humanity displayed in Gneisenau’s image, Carl’s expression is full of love and trust. While the demeanor is somewhat melancholic, the face is still relaxed and open. Notwithstanding the dark circles around the eyes, they look lively and almost smiling. 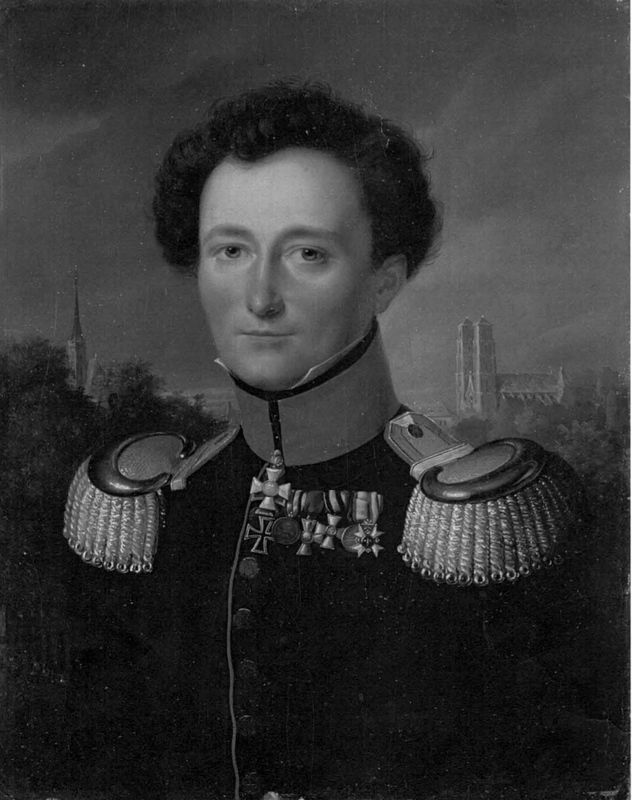 Clausewitz seldom let his guard down in front of strangers, never mind a well-known artist hired to capture his image for the posterity. It’s true that his most famous portrait by Wilhelm Wach displays similar melancholic but warm demeanor. However, there is some evidence that Wach’s painting was done post-mortem based on earlier portraits and sketches (for instance in 1830-31, the artist lived in Berlin while Clausewitz was for the most part away from the capital; Breslau’s landmarks in background are also generic elements). In this case, the newly discovered image might have been the base for Wach’s portrait. This entry was posted on July 14, 2015, 12:06 pm and is filed under Research. You can follow any responses to this entry through RSS 2.0. You can leave a response, or trackback from your own site.